The Epistle to the Ephesians, also called the Letter to the Ephesians and often shortened to Ephesians, is the tenth book of the New Testament. Its authorship has traditionally been credited to Paul the Apostle but, starting in 1792, this has been challenged as Deutero-Pauline, that is, written in Paul's name by a later author strongly influenced by Paul's thought. Another major theme in Ephesians is the keeping of Christ's body (that is, the Church) pure and holy. From Ephesians 4:17–6:20 the author of the Epistle to the Ephesians gives practical advice in how to live a holy, pure, and Christ-inspired lifestyle. Many devotional thoughts and sermons that are addressed to the practically minded individual have been drawn from this section of the New Testament, due to its nature as being good for application studies. According to tradition, the Apostle Paul wrote the letter while he was in prison in Rome (around AD 62). This would be about the same time as the Epistle to the Colossians (which in many points it resembles) and the Epistle to Philemon. However many critical scholars have questioned the authorship of the letter and suggest that it may have been written between AD 80 and 100. The first verse in the letter identifies Paul as its author. While early lists of New Testament books, including Marcion's canon and the Muratorian fragment, attribute the letter to Paul, more recently there have been challenges to Pauline authorship on the basis of the letter's characteristically non-Pauline syntax, terminology, and eschatology. There are four main theories in biblical scholarship that address the question of Pauline authorship. The traditional view that the epistle is written by Paul is supported by scholars that include Frank Thielman, Ezra Abbot, Asting, Gaugler, Grant, Harnack, Haupt, Fenton John Anthony Hort, Klijn, Johann David Michaelis, A. Robert, and André Feuillet, Sanders, Schille, Brooke Foss Westcott, and Theodor Zahn. For a defense of the Pauline authorship of Ephesians, see Ephesians: An Exegetical Commentary by Harold Hoehner, pp 2–61. A second position suggests that Ephesians was dictated by Paul with interpolations from another author. Some of the scholars that espouse this view include Albertz, Benoit, Cerfaux, Goguel, Harrison, H. J. Holtzmann, Murphy-O'Connor, and Wagenfuhrer. Currently, most critical scholars think it improbable that Paul authored Ephesians. Among this group are Allan, Beare, Brandon, Bultmann, Conzelmann, Dibelius, Goodspeed, Kilsemann, J. Knox, W.L. Knox, Kümmel, K and S Lake, Marxsen, Masson, Mitton, Moffatt, Nineham, Pokorny, Schweizer, and J. Weiss. Still other scholars suggest there is a lack of conclusive evidence. Some of this group are Cadbury, Julicher, McNeile, and Williams. 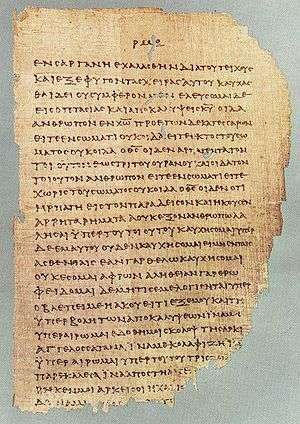 While most English translations indicate that the letter was addressed to "the saints who are in Ephesus" (1:1), the words "in Ephesus" do not appear in the best and earliest manuscripts of the letter, leading most textual critics, like Bart Ehrman, to regard the words as an interpolation. This lack of any internal references to Ephesus in the early manuscripts may have led Marcion, a second-century heresiarch who created the first New Testament canon, to believe that the letter was actually addressed to the church at Laodicea, for details see Epistle to the Laodiceans. The view is not uncommon in later traditions either, considering that the content of the letter seems to suggest a similar socio-critical context to the Laodicean church mentioned in the Revelation of John. Furthermore, if Paul is regarded as the author, the impersonal character of the letter, which lacks personal greetings or any indication that the author has personal knowledge of his recipients, is incongruous with the account in Acts of Paul staying more than two years in Ephesus. For these reasons, most regard Ephesians to be a circular letter intended for many churches. If Paul was the author of the letter, then it was probably written from Rome during Paul's first imprisonment (3:1; 4:1; 6:20), and probably soon after his arrival there in the year 62, four years after he had parted with the Ephesian elders at Miletus. However, scholars who dispute Paul's authorship date the letter to between 70–80 AD. In the latter case, the possible location of the authorship could have been within the church of Ephesus itself. Ignatius of Antioch himself seemed to be very well versed in the epistle to the Ephesians, and mirrors many of his own thoughts in his own epistle to the Ephesians. The major theme of the letter is the unity and reconciliation of the whole of creation through the agency of the Church and, in particular, its foundation in Christ as part of the will of the Father. In the Epistle to the Romans, Paul writes from the point of view of the demonstration of the righteousness of God — his covenant faithfulness and saving justice — in the gospel; the author of Ephesians writes from the perspective of union with Christ, who is the head of the true church. 1:3–2:10. A general account of the blessings that the gospel reveals. This includes the source of these blessings, the means by which they are attained, the reason why they are given, and their final result. The whole of the section 1:3–23 consists in the original Greek of just two lengthy and complex sentences (1:3–14,15-23). It ends with a fervent prayer for the further spiritual enrichment of the Ephesians. 2:11–3:21. A description of the change in the spiritual position of Gentiles as a result of the work of Christ. It ends with an account of how Paul was selected and qualified to be an apostle to the Gentiles, in the hope that this will keep them from being dispirited and lead him to pray for them. 4:1–16. A chapter on unity in the midst of the diversity of gifts among believers. 4:17–6:9. Instructions about ordinary life and different relationships. 6:10–24. The imagery of spiritual warfare (including the metaphor of the Armor of God), the mission of Tychicus, and valedictory blessings. Paul's first and hurried visit for the space of three months to Ephesus is recorded in Acts 18:19–21. The work he began on this occasion was carried forward by Apollos[18:24–26] and Aquila and Priscilla. On his second visit early in the following year, he remained at Ephesus "three years," for he found it was the key to the western provinces of Asia Minor. Here "a great door and effectual" was opened to him,[1 Cor 16:9] and the church was established and strengthened by his diligent labours there. [Acts 20:20,31] From Ephesus the gospel spread abroad "almost throughout all Asia. "[19:26] The word "mightily grew and prevailed" despite all the opposition and persecution he encountered. On his last journey to Jerusalem, the apostle landed at Miletus and, summoning together the elders of the church from Ephesus, delivered to them a farewell charge,[20:18–35] expecting to see them no more. Acts 20:19 = Eph. 4:2. The phrase "lowliness of mind". Acts 20:27 = Eph. 1:11. The word "counsel", denoting the divine plan. Acts 20:32 = Eph. 3:20. The divine ability. Acts 20:32 = Eph. 2:20. The building upon the foundation. Acts 20:32 = Eph. 1:14,18 "The inheritance of the saints." The purpose of the epistle, and to whom it was written, are matters of much speculation. :p.229 It was regarded by C.H. Dodd as the "crown of Paulinism. ":p.229 In general, it is born out of its particular socio-historical context and the situational context of both the author and the audience. Originating in the circumstance of a multicultural church (primarily Jewish and Hellenistic), the author addressed issues appropriate to the diverse religious and cultural backgrounds present in the community. 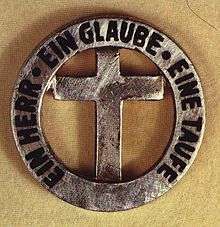 German inscription of the text, "One Lord, One faith, One baptism," (Ephesians 4:5). Paul exhorts the church repeatedly to embrace a specific view of salvation, which he then explicates. It seems most likely that Paul's Christology of sacrifice is the manner in which he intends to effect an environment of peace within the church. In short: "If Christ was sacrificed for your sake, be like him and be in submission to one another." Paul addresses hostility, division, and self-interest more than any other topic in the letter, leading many scholars to believe that his primary concern was not doctrinal, but behavioral. The Pauline theme of unity based on a sacrificial Christology may also be noted in the epistle to the Philippians. Ephesians is notable for its domestic code treatment in 5:22–6:9, covering husband-wife, parent-child, and master-slave relationships. In 5:22, wives are urged to submit to their husbands, and husbands to love their wives "as Christ loved the Church." Christian Egalitarian theologians, such as Katharine Bushnell and Jessie Penn-Lewis, interpret these commands in the context of the preceding verse, 5:21 for all Christians to "submit to one another." Thus, it is two-way, mutual submission of both husbands to wives and wives to husbands. But according to Peter O'Brien, Professor Emeritus at Moore Theological College, this would be the only instance of this meaning of submission in the whole New Testament, indeed in any extant comparable Greek texts; by O'Brien's account, the word simply does not connote mutuality. Dallas Theological Seminary professor Daniel Wallace understands it to be an extension of 5:15–21 on being filled by the Holy Spirit. In the context leading up to the American Civil War (1861–65), Ephesians 6:5 on master-slave relationships was one of the Bible verses used by Confederate slaveholders in support of a slaveholding position. 1 2 3 Ehrman, Bart D. (2004). The New Testament: A Historical Introduction to the Early Christian Writings. New York: Oxford. pp. 381–384. ISBN 0-19-515462-2. 1 2 "USCCB – NAB – Ephesians – Introduction". Archived from the original on 4 January 2009. Retrieved 2009-01-17. ↑ Perrin, Norman (1982). The New Testament: An Introduction. Second Edition. New York: Harcourt Brace Jovanovich. pp. 218–222. ISBN 0-15-565726-7. 1 2 Bruce, F. F. (1988). The Canon of Scripture. Downers Grove, IL: InterVarsity Press. pp. 142, 158–160. ISBN 978-0830812585. 1 2 Attridge, Harold W.; Meeks, Wayne A., eds. (2006). The HarperCollins Study Bible (Revised ed.). New York: HarperCollins. pp. 1982–3. ISBN 978-0061228407. 1 2 O'Brien, Peter T. (1999). Carson, D. A., ed. The Letter to the Ephesians. The Pillar New Testament Commentary. Grand Rapids, Michigan: Eerdmans. p. 5. ISBN 978-0802837363. ↑ Snodgrass, Klyne (1996). The NIV Application Commentary: Ephesians. Zondervan. p. 21. ISBN 978-0310493402. 1 2 Bruce, F.F. The New International Commentary on the New Testament. Eerdmans, 1984, 1991. ISBN 0-8028-2401-3. ↑ Bushnell, Katharine (December 1930). "Dr. Katharine C. Bushnell: A Brief Sketch of Her Life Work" (PDF). Biblical Recorder: 13. Archived (PDF) from the original on 25 June 2016. Retrieved July 5, 2016. ↑ Haddad, Mimi (Spring 2008). "Jessie Penn-Lewis's Cross Theology: Gender Relations in the New Covenant" (PDF). Priscilla Papers. Christians for Biblical Equality. 22 (2): 7. Archived (PDF) from the original on 5 July 2016. Retrieved July 5, 2016. ↑ O'Brien, Peter T. (1999). Carson, D. A., ed. The Letter to the Ephesians. The Pillar New Testament Commentary. Grand Rapids, Michigan: Eerdmans. pp. 401–404. ISBN 978-0802837363. ↑ E.N. Elliott, ed. Cotton is king, and pro-slavery arguments comprising the writings of Hammond, Harper, Christy, Stringfellow, Hodge, Bledsoe, and Cartwright, on this important subject. Augusta, Ga. : Pritchard, Abbott & Loomis, 1860. Christy, David; Bledsoe, Albert Taylor; Stringfellow, Thornton; Harper, Robert Goodloe; Hammond, James Henry; Cartwright, Samuel Adolphus; Hodge, Charles (1860). Cotton is King – Google Books. Retrieved 2009-03-13. This article incorporates text from a publication now in the public domain: Easton, Matthew George (1897). "Ephesians, Epistle to the". Easton's Bible Dictionary (New and revised ed.). T. Nelson and Sons. Ephesians Online – a collection of resources on the Epistle to the Ephesians - This link is dead. The website has gone. Schem, A. J. (1879). "Ephesians, Epistle to the". The American Cyclopædia.